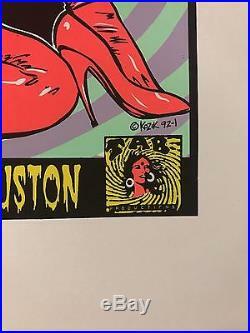 THE CRAMPS DENVER 2000 ORIGINAL CONCERT POSTER KUHN SILKSCREEN PUNK MEMPHIS Condition: NM Dimensions: 20 x 26 inches Designer: Lindsey Kuhn Edition: 169 Year: 2000 SKU: 19410 DESCRIPTION Original silkscreen concert poster for The Cramps at The Ogden Theatre in Denver, CO in 2000. 20 x 26 inches. Signed and numbered out of 169 by the artist Lindsey Kuhn. ABOUT POSTERSCENE PosterScene is Boulder’s premier Rock’n’ Roll store! PosterScene is devoted to rare and collectible concert posters, vintage music advertisements, movie posters, authentic autographs, concert photography, and other entertainment memorabilia. Our inventory consists of, but is not limited to: – Limited edition silkscreen posters by renowned artists such as Kozik, Emek, Chuck Sperry, Jim Pollock, Mile DuBois, Bob Masse, Richard Biffle, Jeff Wood, Ken Taylor, AJ Masthay, David Welker, Jermaine Rogers, Dan Stiles, Darren Grealish, Lindsey Kuhn, Todd Slater, and many others. Vintage 1960’s and 70’s concert posters frrom the San Francisco and Denver area, such as The Fillmore, Avalon and Family Dog. Posters from the new Bill Graham Fillmore series, as well as the Warfield BGP series. Telephone pole advertising posters, flyers and handbills from around the world. 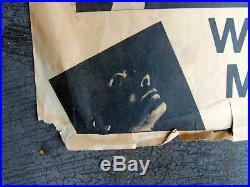 Vintage concert and promo newspaper advertisement clipping from the 1960’s and 70’s. Various rare music memorabilia including backstage passes, tour programs, autographs, photos, and just about any other music related collectible we can find. Collectible vinyl record albums. Rare concert items for Rolling Stones, Grateful Dead, White Stripes, Allman Brothers, Beatles, Phish, Furthur, Dave Matthews Band, Fleetwood Mac, String Cheese Incident, John Mayer, Black Crowes, Ween, Pixies, Bassnectar, Bruce Springsteen, Frank Zappa, Eric Clapton, Bob Dylan, Bob Marley, Led Zeppelin, Avett Brothers, Modest Mouse, Pearl Jam, Jimi Hendrix, Janis Joplin, The Doors, Mumford and Sons, Hunter S. Thompson, Chance The Rapper, Tool, Wilco, Primus, Tame Impala, Kings of Leon, Pink Floyd, Radiohead, and many more. The item “THE CRAMPS DENVER 2000 ORIGINAL CONCERT POSTER KUHN SILKSCREEN PUNK MEMPHIS” is in sale since Friday, August 19, 2016. This item is in the category “Entertainment Memorabilia\Music Memorabilia\Other Music Memorabilia”. The seller is “happysadmusic” and is located in Boulder, Colorado. This item can be shipped to North, South, or Latin America, all countries in Europe, all countries in continental Asia, Australia, South africa, New Zealand. 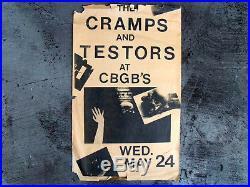 THE CRAMPS ViNTaGe 1979 PRoMo PoSTeR CBGB’S NeW YoRK PuNK CoNCeRT WiTH TeSToRS. THE CRAMPS VINTAGE 1979 This is the original Vengeance Records CBGB’S CONCERT POSTER With opening act THE TESTORS POSTER SIZE: 8.5″ x 14″ Poster in rough shape as seen in photos but would display splendidly in a frame! SUPER RARE CRAMPS ARTIFACT RARELY (IF EVER) COMES TO MARKET! The item “THE CRAMPS ViNTaGe 1979 PRoMo PoSTeR CBGB’S NeW YoRK PuNK CoNCeRT WiTH TeSToRS” is in sale since Thursday, November 09, 2017. This item is in the category “Entertainment Memorabilia\Music Memorabilia\Rock & Pop\Artists C\Other Rock & Pop Artists C”. The seller is “goldmillionrecords” and is located in Bryn Mawr, Pennsylvania. This item can be shipped to United States, all countries in Europe, Canada, Japan, Australia. This poster has a very tiny (1/2 dime sized) water stain on the edge that will be covered by framing. Recently acquired from the estate of a music promoter. Stored for many years. This is an original poster that came from a lady who worked with TAB in the early 1990’s and has been in unopened storage for at least the last 15 years. I have several of these posters available, and they are all in near identical condition. We try to keep your cost as low as possible and offer multiple options when available. Any new item will be unused. The box or packaging may show substantial wear from storage, but the item inside will be new. The pictures are the biggest part of the description. The last two digits in our item title are simply a personal inventory number. Human error occasionally occurs, and we will work with you to make sure you are satisfied. Sometimes, an item arrives damaged. We always make this right. 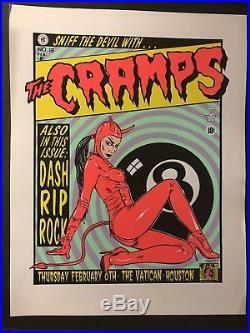 The item “The Cramps 8 Ball Devil Houston Vatican Kozik concert POSTER’92 Silkscreen” is in sale since Friday, October 06, 2017. This item is in the category “Entertainment Memorabilia\Music Memorabilia\Rock & Pop\Artists C\Other Rock & Pop Artists C”. 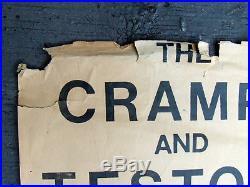 The seller is “cbmtreasuresfound” and is located in Coupland, Texas. This item can be shipped to United States, Canada, United Kingdom, Denmark, Romania, Slovakia, Bulgaria, Czech republic, Finland, Hungary, Latvia, Lithuania, Malta, Estonia, Australia, Greece, Portugal, Cyprus, Slovenia, Japan, China, Sweden, South Korea, Indonesia, Taiwan, South africa, Thailand, Belgium, France, Hong Kong, Ireland, Netherlands, Poland, Spain, Italy, Germany, Austria, Russian federation, Israel, Mexico, New Zealand, Philippines, Singapore, Switzerland, Norway, Saudi arabia, United arab emirates, Qatar, Kuwait, Bahrain, Croatia, Malaysia, Brazil, Chile, Colombia, Costa rica, Dominican republic, Panama, Trinidad and tobago, Guatemala, El salvador, Honduras, Jamaica. 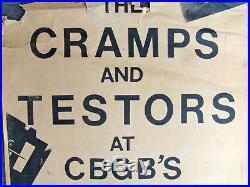 THE CRAMPS ViNTaGe 1979 PRoMo PoSTeR CBGB’S NeW YoRK PuNK CoNCeRT WiTH TeSToRS. 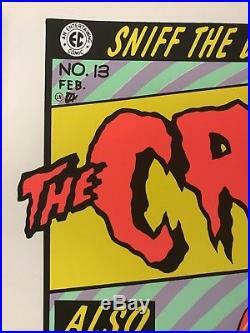 THE CRAMPS VINTAGE 1979 This is the original Vengeance Records CBGB’S CONCERT POSTER With opening act THE TESTORS POSTER SIZE: 8.5″ x 14″ Poster in rough shape as seen in photos but would display splendidly in a frame! SUPER RARE CRAMPS ARTIFACT RARELY (IF EVER) COMES TO MARKET! The item “THE CRAMPS ViNTaGe 1979 PRoMo PoSTeR CBGB’S NeW YoRK PuNK CoNCeRT WiTH TeSToRS” is in sale since Tuesday, October 10, 2017. This item is in the category “Entertainment Memorabilia\Music Memorabilia\Rock & Pop\Artists C\Other Rock & Pop Artists C”. The seller is “goldmillionrecords” and is located in Bryn Mawr, Pennsylvania. This item can be shipped to United States, all countries in Europe, Canada, Japan, Australia. THE CRAMPS CHICAGO 1996 ORIGINAL CONCERT POSTER KUHN SILKSCREEN Condition: VF+ Dimensions: 23 x 28 inches Designer: Lindsey Kuhn Edition: 250 Year: 1996 SKU: 19530 DESCRIPTION Original silkscreen concert poster for The Cramps at The Metro in Chicago, IL in 1996. Signed and numbered out of 250 by the artist Lindsey Kuhn. 23 x 28 inches. ABOUT POSTERSCENE PosterScene is Boulder’s premier Rock’n’ Roll store! Our retail shop is located in downtown Boulder, CO at 1505 Pearl Street. We are on Pearl between the Pearl Street Mall and the Mountain Sun Brewery. View our About Us. Page to learn more about our Boulder store. PosterScene is devoted to rare and collectible concert posters, vintage music advertisements, movie posters, authentic autographs, concert photography, and other entertainment memorabilia. Our inventory consists of, but is not limited to: – Limited edition silkscreen posters by renowned artists such as Kozik, Emek, Chuck Sperry, Jim Pollock, Mile DuBois, Bob Masse, Richard Biffle, Jeff Wood, Ken Taylor, AJ Masthay, David Welker, Jermaine Rogers, Dan Stiles, Darren Grealish, Lindsey Kuhn, Todd Slater, and many others. Vintage 1960’s and 70’s concert posters frrom the San Francisco and Denver area, such as The Fillmore, Avalon and Family Dog. Posters from the new Bill Graham Fillmore series, as well as the Warfield BGP series. Telephone pole advertising posters, flyers and handbills from around the world. Vintage concert and promo newspaper advertisement clipping from the 1960’s and 70’s. Various rare music memorabilia including backstage passes, tour programs, autographs, photos, and just about any other music related collectible we can find. Collectible vinyl record albums. Rare concert items for Rolling Stones, Grateful Dead, White Stripes, Allman Brothers, Beatles, Phish, Furthur, Dave Matthews Band, Fleetwood Mac, String Cheese Incident, John Mayer, Black Crowes, Ween, Pixies, Bassnectar, Bruce Springsteen, Frank Zappa, Eric Clapton, Bob Dylan, Bob Marley, Led Zeppelin, Avett Brothers, Modest Mouse, Pearl Jam, Jimi Hendrix, Janis Joplin, The Doors, Mumford and Sons, Hunter S. Thompson, Chance The Rapper, Tool, Wilco, Primus, Tame Impala, Kings of Leon, Pink Floyd, Radiohead, and many more. The item “THE CRAMPS CHICAGO 1996 ORIGINAL CONCERT POSTER KUHN SILKSCREEN” is in sale since Saturday, July 30, 2016. This item is in the category “Entertainment Memorabilia\Music Memorabilia\Other Music Memorabilia”. The seller is “happysadmusic” and is located in Boulder, Colorado. This item can be shipped worldwide.